According to The Sun Newspaper, a National Executive Committee, NEC, member of the Arewa Consultative Forum, ACF, Alhaji Mohammed Abdulrahman has disclosed that some ex-military officers and politicians are reforming the defunct Social Democratic Party, SDP, into an organized and effective political force ahead of the 2019 elections. Mohammed, a former political secretary of the Northern socio-cultural group, ACF and an international security surveillance consultant since the time of Shehu Musa Yar’Adua’s tenure as Chief of Staff, Supreme Headquarters, revealed to Sunday Sun in an exclusive interview last Tuesday that three Peoples Democratic Party, PDP, stalwarts have already signed a Memorandum of Understanding with the SDP. According to him, all the retired soldiers in Nigeria, whether under Obasanjo, Babangida, the retired soldiers, ex-military officers are the people leading the SDP back to light. “They are getting ready. If 2019 proves to be a herdsman issue and a Buhari power confrontation… all the former soldiers will set up a group that will deal with Buhari and every other person in Nigeria that is creating problem. So, they should not just look at SDP simply,” he added. Mohammed also addressed other pressing national issues facing Nigeria and disclosed that the government was planning a firm official action to be taken against the media in Nigeria. Recently, PMB appointed Tinubu to bring about an end to the crises in the All Progressives Congress, APC, by reconciling the warring factions in the party. I’ll like to have your thoughts on that. I think Buhari may have the honour to be president of Nigeria, but I think he is very bereft of political wisdom, a man lacking, very lacking…the poverty of political wisdom is afflicting him. No. I am not going to tell you that. You won’t hear it from my mouth. But I know Atiku is one of them. They contacted Binta Yar’Adua but she said she is not a politician and that her husband is dead now, that the leaders of the party that were close to her husband at that time can go ahead and do what they want to do. But definitely, she is not a politician. Three former Heads of State are in support of this arrangement. Oh no, my brother, I can’t tell you. Why are you trying to railroad me into this talk? It is too premature to talk about that. They have three powerful former Heads of State behind them and they have South West behind them. The three key figures you mentioned- Jerry Gana, Tunde Adeniran and Ibrahim Mantu- are still with the PDP and here you are linking them with the SDP. They have signed a Memorandum of Understanding with the SDP already. Bukola Saraki is with them. Ekweremadu is with them; Rochas Okorocha is with them, Willy Obiano is with them. That recalcitrant governor that is from Rivers State, Wike is with them. Intimidation; you remember one time I said Buhari should release the people that they have arrested? I said all the people they have arrested let them release them. You don’t arrest the people you want to rule over. That will be his saving grace and protection. But with all the people incarcerated now and the arrests they are making about this thing is going to finish Buhari before he starts reining down the current political establishments in Nigeria. That is the situation. And the Buhari government is planning to clamp down on the media. They should not try it because if the media gets back into the trenches, the government is finished. I am being honest with you. They are going to clamp down on the media. That is what the cabal asked him to do. 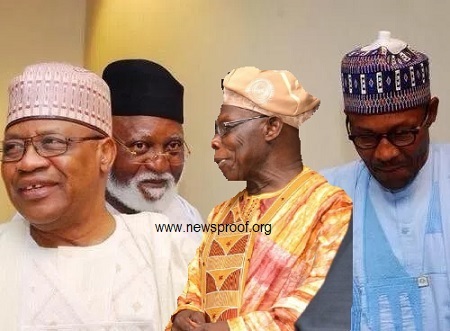 They feel if they are able to do that they would have effectively cut down Obasanjo and Babangida’s influence on the political journey to 2019. But they are wasting their time.